The Cenozoic sedimentary basins and related volcanic belts of the Southern Puna formed on a continental crust which is composed of Precambrian to Early Paleozoic crystalline basement rocks and Lower Paleozoic strata as well as Permian and Mesozoic rocks. A fivefold division of the Cenozoic, whose oldest sediments have a Late Eocene age, is evident in the Salar de Antofalla area. Crystalline basement rocks are exposed along the western margin of the Salar de Antofalla associated with reverse faults, west and southwest of the volcano Tebenquicho, south of the Sierra de la Quebrada Honda, and at the southwestern border of the Sierra de Calalaste. Migmatic gneisses and metabasites, penetrated by several generations of granitoids and aplites, prevail. Age determinations on a migmatic gneiss yielded 419.0 ± 8.0 Ma and on two granite samples 417.0 ± 8.0 Ma as well as 389.0 ± 8.0 Ma . The Archibarca granite, located in the NW of the study area, has an Early Paleozoic age of 485.0 ± 15.0 Ma (Palma et al. 1986). Intensely deformed phyllites and metagraywackes occur in tectonic contact with high-grade metamorphic rocks northeast of the Vega Quiñoas (Fig. 2). Based on lithological similarities we consider them as an equivalent to the Late Precambrian Puncoviscana Formation which crops out in widespread areas of NW Argentina (Aceñolaza et al. 1988). Among the most common rocks forming the Andean basement east of the Salar de Antofalla are low-grade metasediments with intercalated metabasites of Early Paleozoic age. The sedimentary suite is represented by a thick alternation of mostly turbiditic sandstones and siltstones. Common features are Bouma cycles, sharp erosional contacts, flute casts, and tool marks. The rock age is not well defined. In the Salar del Hombre Muerto area, a graptolite assemblage indicates a Middle to Late Ordovician age (Aceñolaza et al. 1975). Due to lithological and facies similarities, these rocks may be an analogue of Ordovician sediments of the Northern Puna which Bahlburg (1990) interpreted as deep water sediments deposited in a backarc basin. North of the Vega Quiñoas, the crystalline basement is nonconformably overlain by unmetamorphosed siliciclastic sediments of Permian age. They are composed of a coarse basal conglomerate, derived from the crystalline basement, followed by an alternation of large-scale cross-bedded quartz sandstones and quartz conglomerates, probably representing a beach environment. In the Salina del Fraile area, an approximately 200 m thick succession of playa/sebkha siltstones and eolian sandstones overlain by an alternation of quartz sandstones and reddish siltstones of a presumably littoral environment is exposed. Petrified fragments of stigmaria root of Lepidodendron or Sigillaria indicate a Late Carboniferous to Early Permian age. Interbedded tuff layers yielded ages of 268.0 ± 6.0 Ma, 276.0 ± 1.0 Ma and 264.5 ± 1.5 Ma. Another age (281.0 ± 6.0 Ma) of a tuff layer from the southeastern margin of the Salar de Antofalla hints to the widespread occurrence of Permian sediments in the study area. In the Salina del Fraile area, the Permian strata are cut by dikes of intermediate composition of Triassic age (212.0 ± 5.0 Ma, 234.0 ± 1.0 Ma). The Permian is unconformably overlain by a more than 100 m thick alternation of marls and sandstones with pillow lavas and hyaloclastite breccias at its base and other intercalated lava beds of an Early Jurassic age (198.0 ± 5.0 Ma, 194.0 ± 6.0 Ma). Interbedded are coquina beds and oolithic limestones. Remnants of foraminifera (Psammosphaera sp. ), cyanophyta (Rivularia sp. ), ostracodes, and echinoderms have been found. These and the occurrence of a 2 m thick magnetite placer bed hint towards a deposition in a littoral to shallow marine environment. The Late Eocene to Late Oligocene strata are more than 750 m thick and consist of reddish sometimes gypsiferous pelites and sandstones locally with conglomeratic intercalations. The succession shows variations in facies and lithology which allow a subdivision into two members. The base of the Quiñoas member I is exposed north of the Vega Quiñoas and shows an erosional contact to the underlying pre-Cenozoic rocks. It consists of red conglomerates containing pebbles of phyllites, granites, and schists which originated from the crystalline basement. The remaining part of the first member is dominated by an alternation of siltstones and fine-grained sandstones, rarely interbedded with lenticular bodies of conglomerates. The siltstones show horizontal lamination, bioturbation, and desiccation cracks. Thin gypsum layers are occasionally intercalated. The sandstones display a relatively uniform thickness over a large lateral extent, asymmetrical current-ripples, and erosive basal surfaces. Locally, they are pebbly and contain horizons of mudclasts. Lithology and sedimentary features indicate a deposition in periodically flooded playa sand and mudflats. Member II is dominated by medium- to fine-grained sandstones reaching a thickness of 300 m. They are massively bedded on a scale of 0.5 - 5.0 m, with a planar or erosive lower contact. Sedimentary structures are delineated by the presence of mudstone intraclasts and scattered pebbles as well as low-angle trough cross-bedding at the base and horizontal parallel laminae towards the top of the beds. Based on its sedimentary features, we interpret them as deposits of a fluvial distributary system. In the Quiñoas Formation, unequivocal paleoflow indicators are missing. Paleotransport directions and sedimentary structures for coeval strata in surrounding areas are not available. The only indication for the paleotransport direction was given by Jordan and Alonso (1987) who pointed out that the Oligocene red beds are more conglomeratic in the west than in the east of the Puna. They assumed that an Incaic mountain belt located in central and western Chile supplied the detritus which was shed eastwards to a broad alluvial plain. Intercalated tuff layers indicate the Late Eocene to Late Oligocene age of the Quiñoas Formation. The oldest dated sediments of member I occur at the eastern margin of the Salina del Fraile, but the base is not exposed. A tuff bed in the deepest portion of this section yielded an age of 37.6 ± 0.3 Ma. From another tuff bed near the top of member II an age of 28.9 ± 0.8 Ma has been obtained. The succession is unconformably overlain by conglomerates of the Chacras Formation with a maximum age of 24.2 ± 0.9 Ma. Based on its lithological composition, the Quiñoas Formation is possibly correlative to the Geste Formation of the Pastos Grandes and Arizaro areas as described by Turner (1960), Donato (1987) and Alonso (1992). The Chacras Formation is composed of conglomerates and pebbly sandstones as well as medium- to fine-grained sandstones unconformably overlying member II of the Quiñoas Formation. In the Salina del Fraile area, the succession reaches a thickness of about 350 m, whereby west of Antofalla village more than 600 m are exposed. The conglomerates are massive, poorly sorted, matrix- to clast-supported, and form laterally continuous sheets. Basal bedding contacts are erosional. Pebbles display diameters of up to 0.5 m, are subangular, and originated from the crystalline basement as well as Lower Paleozoic strata. The nature of the conglomerates suggests a deposition in an alluvial fan environment close to the source areas. The uppermost part of the Chacras Formation is dominated by medium- to fine-grained sandstones. They display trough cross-stratification with sets 0.5 - 10.0 m thick, bounded by curved erosion surfaces with a wedge-like appearance. Foreset dips vary between 15° and 25°, declining to around 5° at the base. High-angle trough cross-bedding, grain size characteristics, and excellent sorting correspond to modern eolian dunes. West of the actual Salar de Antofalla, imbricated pebbles of the alluvial fan sediments indicate a flow direction towards the west. In contrast, paleoflow indicators measured east of the actual salar show a general transport towards the east. Most likely, the deposits of the Chacras Formation are derived from the erosion of crystalline basement and Early Paleozoic rocks in the area of the present Salar de Antofalla, which were exposed due to relief-forming contractional tectonism during the Late Oligocene (deformation interval D1, see deformation history). The Late Oligocene to Early Miocene age of the Chacras Formation is evidenced by intercalated tuff layers. The oldest age data was obtained from a tuff bed sampled north of Antofallita (24.2 ± 0.9 Ma [ID-86]). East of the Salina del Fraile, a tuff yielded an age of 22.5 ± 0.6 Ma (ID-18). The sediments of the Chacras Formation are unconformably overlain by volcaniclastic sediments of the Potrero Grande Formation whose maximum age is dated at 18.0 ± 0.6 Ma (ID-52) (Fig. 3). The Early to Middle Miocene Potrero Grande Formation unconformably overlies the deposits of the Chacras Formation. The thickness of the Potrero Grande Formation varies from 50 m near Quiñoas to more than 250 m towards the west in the Salina del Fraile area. Its lithology is characterized by conglomerates composed of volcanic fragments, intercalated fallout tuff layers, and ignimbrites indicating substantial synsedimentary volcanic activity. Sedimentation started with conglomerates and conglomeratic sandstones locally reaching a maximum thickness of about 100 m. Volcanic fragments prevail with diameters up to 1.5 m. Pebbles of the Eocene-Oligocene strata, Lower Paleozoic sediments and crystalline basement rocks are of subordinate frequency. The matrix- to clast-supported conglomerates exhibit erosional basal contacts, channelling, and partially pebble imbrication, and are interpreted as proximal alluvial fan sediments. Greyish sandstones and siltstones interbedded with conglomerates follow upsection. Sedimentological features like medium-scale trough cross-bedding, erosive basal contacts, and channelling indicate a deposition in a fan-related fluvial system. Paleocurrent directions measured on imbricated pebbles of coarse-grained alluvial fan deposits show significant variations indicating a subdivision into several narrow, separate basins. This separation was mainly controlled by another interval of contractional tectonism (D2) during the Early Miocene. A west-vergent reverse fault system at the western margin of the present Salar de Antofalla provides clear evidence for this tectonic phase. Here, progressive angular unconformities in the basal Potrero Grande conglomerates exhibit the synsedimentary displacement of the fault system. In contrast, paleocurrent measurements in imbricated conglomerates in the Salina del Fraile area indicate a main transport from the west, probably with the Sierra de la Quebrada Honda area as source. North of the Salina del Fraile, the Antofalla stratovolcano complex is considered as another source area due to observed flow directions towards the south. Locally, thick ignimbrites and volcanic ash layers are intercalated. The oldest tuff beds of the Potrero Grande Formation of the Salina del Fraile area yielded ages of 18.5 ± 0.5 Ma and 18.0 Ma ± 0.6. Age determinations of other interbedded tuff layers and ignimbrites confirm the Miocene age. The youngest samples are ignimbrites from the top of the Potrero Grande Formation near the Salina del Fraile which yielded ages of 10.9 Ma ± 0.3 and 9.8 Ma ± 0.5. The Middle Miocene to Pliocene Juncalito Formation unconformably overlies the older Tertiary units and is exposed only at the eastern border of the recent Salar de Antofalla. Two major facies associations can be defined: a coarse-grained alluvial fan facies dominating the lower part of the Juncalito Formation and a pelitic/evaporitic playa facies prevailing in the upper part. The alluvial fan deposits are characterized by conglomerates interbedded with pebbly sandstones. They reach a thickness of several hundred meters. The conglomerates contain mainly clasts of Quiñoas sandstones as well as Lower Paleozoic metasediments and metavolcanics originated from the adjacent Sierra de Calalaste area. Also, fragments of the crystalline basement as well as andesite and dacite clasts are observed. The alluvial fan deposits are thought to be products of relief-forming processes due to reverse faulting and thrusting during the deformation interval D3. Paleocurrent measurements indicate a transport mainly from a source area in the east, presumably the Sierra de Calalaste area. The playa deposits represent different subenvironments such as mudflats, sandflats, lakes, and saltpans. Most typical features of the mud and sandflat deposits are reddish sandstones and siltstones. Low-angle cross-bedding, desiccation cracks, interbedded gypsum and halite layers are common. Sheet geometry, large lateral extent, and relatively uniform thickness suggest a prevailing deposition as distal sheetflows. Intercalated in the playa mud and sandflat deposits occur saltpan sediments consisting of alternating millimeter- to decimeter-scale layers of halite and mud. They have been deposited in saline lakes producing successive layers of salt by repeated flooding and subsequent reprecipitation. In the central part of the basin, massive halite reaches a thickness of 50 m. Lacustrine sediments were deposited in marginal parts of the basin. They consist of gypsum horizons, grey marls, and white limestones with frequent stromatolites, pisolites, and oolites. Their widespread occurrence in the middle part of the section is thought to be linked to a stage of relative tectonic quiescence and relief equilibration. The base of the Juncalito Formation is marked by high diachronism. 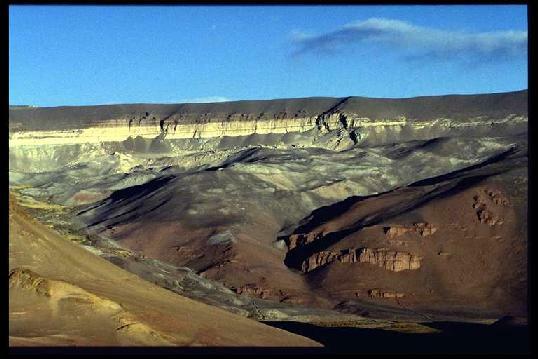 While deposition of the Potrero Grande Formation in the Salina del Fraile area continued until 10 Ma, sedimentation of the Juncalito Formation in the Salar de Antofalla area started at about 11 to 12 Ma. This age is indicated by intercalated pyroclastic rocks. At the base of the exposed section a brecciated pyroclastic layer possibly a lahar deposit yielded an age of 11.2 ± 0.3 Ma. From other tuffs higher upsection, ages of 9.3 ± 0.2 Ma, 7.9 ± 0.3 Ma, and 4.6 ± 0.5 Ma were obtained. Age equivalence and lithological similarities permit a correlation of the Juncalito Formation with the Sijes Formation of the Pastos Grandes and Arizaro areas described by Turner (1960) and Alonso et al. (1991). The final sedimentation (Escondida Formation) is marked by the abundance of coarse-grained conglomerates unconformably overlying the Juncalito strata. The conglomerates are massive and poorly sorted. They are both, matrix- and clast-supported forming laterally continuous sheets and channel-like bodies, respectively. Basal bedding contacts are mostly erosional. Based on the sedimentary features, a deposition in a proximal alluvial fan environment is proposed. A maximum thickness of several hundred meters is reached directly at the border of the Sierra de Calalaste, whereby in more distal parts the average thickness is about 30 to 50 m. The clasts are subangular to angular, and reach diameters up to 1.0 m. The composition is similar to those of the Juncalito Formation. Paleocurrent measurements also indicate a main transport from a source area in the east, the Sierra de Calalaste. Its uplift along extended reverse fault and thrust systems was connected to the final shortening D4 see deformation history). Due to ongoing synsedimentary compressional deformation, the coarse-grained sediments of the Escondida Formation show internally some angular unconformaties. The oldest sediments of this succession were tectonically affected. Intercalated tuffs yielded an age of 3.605 ± 0.005 Ma and 3.2 ± 0.1 Ma. For one of the unaffected fan bodies we obtained an age of 0.47 ± 0.01 Ma. Due to lithostratigraphic comparisons we consider the Escondida Formation as an equivalent to the Batín Formation of the Arizaro area (Donato 1987) and the Singuel Formation of the Pastos Grandes area (Alonso and Gutiérrez 1986). for citation use: Kraemer, B., Adelmann, D., Alten, M., Schnurr, W., Erpenstein, K., Kiefer, E., van den Bogaard, P. and Görler, K. (in press): Incorporation of the Paleogene foreland into the Argentina Puna plateau: The Salar de Antofalla area, Southern Central Andes - Journal of South American Earth Sciences 12/2.